Sensitive files linked to the United States intelligence agency were reportedly left on a public Amazon server by one of the nation’s top intelligence contractor without a password, according to a new report. The documents included passwords to a US government system containing sensitive information, and the security credentials of a senior employee of Booz Allen Hamilton, one of the country’s top defense contractors. Although there wasn’t any top secret file in the cache Vickery discovered, the documents included credentials to log into code repositories that could contain classified files and other credentials. What’s more? The exposed data even contained master credentials granting administrative access to a highly-protected Pentagon system. The sensitive files have since been secured and were likely hidden from those who didn’t know where to look for them, but anyone, like Vickery, who knew where to look could have downloaded those sensitive files, potentially allowing access to both highly classified Pentagon material and Booz Allen information. “In short, information that would ordinarily require a Top Secret-level security clearance from the DoD was accessible to anyone looking in the right place; no hacking was required to gain credentials needed for potentially accessing materials of a high classification level,” Vickery says. “Booz Allen takes any allegation of a data breach very seriously, and promptly began an investigation into the accessibility of certain security keys in a cloud environment,” a Booz Allen spokesperson told Gizmodo. Federal Trade Commission experiment lured hackers to learn about how they use stolen consumer information. The Federal Trade Commission (FTC)’s Office of Technology conducted an experiment to learn how hackers use stolen information. Experts created a database of fake consumer credentials and posted them twice on a site that hackers use to make stolen data public. This false information was made realistic by using popular names based on Census data, US-based addresses and phone numbers, common email address naming strategies, and one of three types of payment info (online payment service, bitcoin wallet, and credit card). Following the second posting of fake data, it took hackers just nine minutes to try and access it. There were more than 1,200 attempts to access the information, which hackers tried to use to pay for things like food, clothing, games, and online dating memberships. The FTC advises consumers to stay safe with two-factor authentication, which prevented the thieves from gaining access. Researchers have discovered a significant software flaw in the energy grid equipment sold by General Electric (GE) that could allow even lone attackers with limited resources to “disconnect sectors of the power grid at will”. Last week, however, GE suddenly announced that it had issued fixes for five of the six flaws, with the last on its way. Black Hat sessions specialise in telling the world about new flaws and proof-of-concept attacks, but it is unusual in this sector for the mere publication of a public presentation to spur PR into action like this. Essentially, we completely broke the homebrew encryption algorithm used by these protection and management devices to authenticate users and allow privileged operations. This doesn’t sound good, nor the fact that the researchers promise a live demo of the compromise as part of a “budget” attack. The importance of this being the fact that “to date, cyber-attacks against power systems are considered to be extremely sophisticated and only within the reach of nation-states”. The two best documented energy grid attacks – the 2015 and 2016 attacks on Ukrainian power stations – were pinned on hackers backed by the resources of a nation state. If the sessions serves up something that would be possible by anyone, even that that assumption will start to wilt. We have been in the process of issuing notifications and providing product upgrades to our affected customer base on available firmware updates to address this issue. The flaw had not been used to cause power outages and only involved GE protection relays dating from the 1990s, “before current industry expectations for security”. One might point out that energy infrastructure installed in the 1990s by vendors such as GE will still affect a lot of equipment in the US and beyond. Finding and patching that equipment could take a lot of effort for an industry not used to the luxury of downtime. The counter-argument is that compromising energy systems still requires a lot of understanding of the target. It’s not clear that a bedroom attacker would have the ability to do this, nor the ability to exploit all aspects of the attack remotely. It does at least serve to remind us how security researchers have gone from being nuisance to saviour. Patching energy grid systems is the sort of problem the world must find a way to live with. Security experts from security firm Check Point warn of a subtitles hack threatens Millions of devices. According to the experts at Check Point, hackers could exploit a new attack vector that uses malicious subtitles to compromise devices via their media players. Millions of users worldwide can be targeted due to security vulnerabilities in many popular streaming platforms, including VLC, Kodi (XBMC), Popcorn-Time, and stream.io. The patch for these vulnerabilities are available for download, users should apply them immediately. According to the security firm, approximately 200 million video players and streamers are currently exposed to subtitle attack. The attackers can craft malicious subtitle files that once executed by a user media player can allow attackers to take complete control over any type of device (i,e, laptops, smart TVs, tablets, and smartphones). Unlike other attack vectors well known to security firms, this hacking technique is very subtle because subtitles are perceived harmless text files and are not subject to the inspection of security solutions. In subtitles hack, the subtitle can be manipulated by attackers for several malicious purposes. “This method requires little or no deliberate action on the part of the user, making it all the more dangerous,” states Check Point. Check Point analyzed vulnerabilities in media players that allow a remote attacker to execute code and gain control full control of the targeted system. The researchers were able to exploit a flaw in the popular VLC player to trigger a memory corruption issue and to gain control of a PC. Similar successful tests allowed the researchers to demonstrate subtitles hack on other players. Check Point presented a proof of concept attack, says victims are persuaded to visit a malicious website that uses one of the streaming video players, or they are tricked into running a malicious subtitle file on their system that they intentionally downloaded for use with a video. “By conducting attacks through subtitles, hackers can take complete control over any device running them. From this point on, the attacker can do whatever he wants with the victim’s machine, whether it is a PC, a smart TV, or a mobile device. The potential damage the attacker can inflict is endless, ranging anywhere from stealing sensitive information, installing ransomware, mass Denial of Service attacks, and much more,” wrote Check Point. Check Point plans to disclose the technical details of the tests only when software updates will be provided to the users. 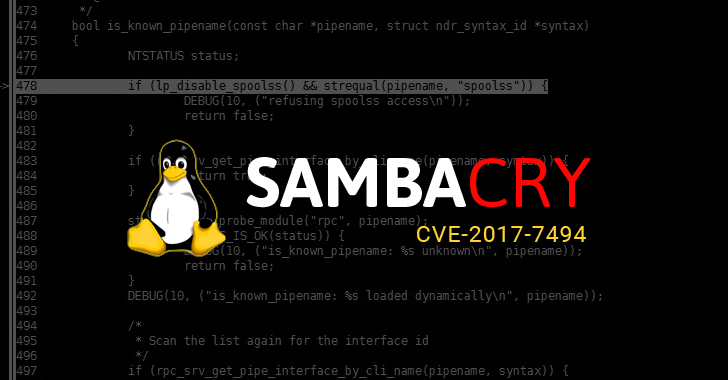 A 7-year-old critical remote code execution vulnerability has been discovered in Samba networking softwarethat could allow a remote attacker to take control of an affected Linux and Unix machines. 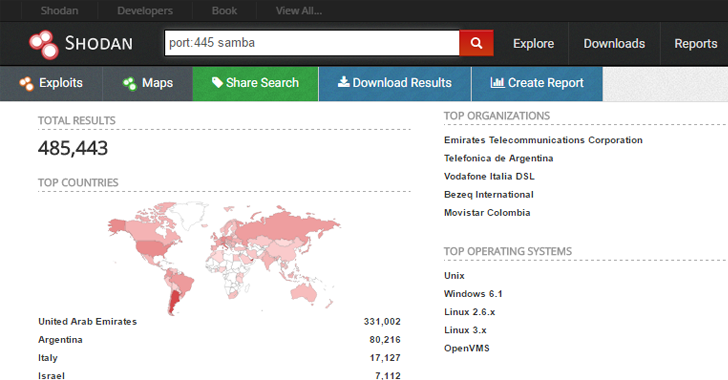 “All versions of Samba from 3.5.0 onwards are vulnerable to a remote code execution vulnerability, allowing a malicious client to upload a shared library to a writable share, and then cause the server to load and execute it,” Samba wrote in an advisory published Wednesday. Since Samba is the SMB protocol implemented on Linux and UNIX systems, so some experts are saying it is “Linux version of EternalBlue,” used by the WannaCry ransomware. …or should I say SambaCry? Once added, restart the network’s SMB daemon (smbd) and you are done. This change will prevent clients from fully accessing some network machines, as well as disable some expected functions for connected Windows systems. The WordPress security team announced the launch of a public bug bounty program that covers the WordPress content management system (CMS) and several related assets. WordPress has been running a private bug bounty program for roughly seven months and it has now decided to make it public. The program is hosted on the HackerOne platform and it covers the WordPress CMS and other open-source projects, including BuddyPress, bbPress and GlotPress. Researchers can also report flaws discovered in the WordPress.org (including subdomains), WordCamp.org, BuddyPress.org, WordPress.tv, bbPress.org and Jobs.WordPress.net websites. White hat hackers have been advised to submit vulnerability reports that include detailed information on the flaw and proof-of-concept (PoC) code. Participants have also been asked to avoid privacy violations and causing damage to live WordPress sites, and give developers a reasonable amount of time to address security holes before their details are made public. The list of vulnerabilities that experts can report includes cross-site scripting (XSS), cross-site request forgery (CSRF), server-side request forgery (SSRF), remote code execution and SQL injection. The bug bounty program does not cover vulnerabilities affecting plugins – these should be reported to the app’s developer, but the WordPress plugins team should be alerted as well. While exceptions may exist, the WordPress security team says it’s typically not interested in basic information disclosure issues, mixed content warnings, lack of HTTP security headers, brute force attacks, XSS flaws that can only be exploited by users with elevated privileges, and reports generated by automated scans. The WordPress security team has not provided any information on rewards, but it did say that seven researchers have so far earned more than $3,700, which indicates an average of roughly $500 per vulnerability report. The bounties will be paid out by Automattic, the company behind WordPress.com, which runs its own bug bounty program on HackerOne. According to WordPress developers, the CMS currently powers more than a quarter of the top ten million websites on the Internet. Given the platform’s popularity, it’s no surprise that researchers often find security holes, including serious vulnerabilities that end up being exploited to hack thousands of websites. Hopefully, the launch of a public bug bounty program will streamline vulnerability reporting to avoid the disclosure of unpatched flaws by researchers who are frustrated with the lack of communication. Organizations Are Struggling to Operationalize Their Knowledge of Risk. Over the past year, cyber risk management has gained a lot of attention in the media and among practitioners. Even though risk management has been proven to optimize business performance and lead to better investment decisions, many organizations have still not adopted this concept when it comes to their enterprise security model. Last week’s WannaCry ransomware attack is a stark reminder that a risk-based approach to security is long overdue. WannaCry is the last cyber-attack to expose the industry’s inability to find and fix threats that really matter. So what’s holding organizations back from implementing cyber risk management? Consider these facts… last Friday, the world faced the biggest cyber-attack yet, with more than 300,000 organizations in more than 200 countries falling victim to the WannaCry ransomware. The malware exploited a known vulnerability in the Microsoft Windows SMB Server, for which the vendor had provided a patch on March 14, 2017. Unfortunately, many organizations had not patched or were simply running on operating systems that had reached their end of life (e.g., Windows XP and Windows Server 2000) and do not receive new security updates. While the attack’s impact has been massive, the story behind it is very characteristic of any successful cyber-attack — hackers are exploiting known vulnerabilities and are betting on the fact that organizations don’t know how to fix what really matters. That’s where cyber risk management comes into play. Many industry standard bodies (e.g., Payment Card Industry) and government regulators (e.g., Office of the Comptroller of the Currency, SEC) have taken steps to propagate the usage of risk management by incorporating its core principles into their regulations. These refreshed guidelines are designed to address several factors including scarcity of resources, the disruptive effect of big data in the context of cyber security, market volatility, regulatory changes, and the need for better, faster decision making. However, many organizations are still struggling to operationalize their knowledge of risk in order to optimize business investments and performance. Let’s look at the factors that are preventing organizations from adopting a risk-based approach to security and what can be done to overcome them. When implementing cyber risk management practices, it is essential to instill a risk-aware culture at all levels and across all functional areas of the organization. Lack of buy-in from all stakeholders is one of the most common hurdles to making the transition from a compliance- to risk-driven approach to security. There are many examples of organizations that hired a first-time Chief Risk Officer in an attempt to force the transition, but failed due to the fact that the individuals required to implement the new practices on a day-to-day basis were still stuck in their antiquated compliance views. To be successful, risk management must avoid a gap between senior management and the rest of the organization when it comes to understanding and embracing risk management concepts and benefits. To address this roadblock, a well thought out training program is required for current and incoming employees. Although risk management was initially introduced to increase shareholder value, not all companies understand its benefits. It is important to realize that there is no one-size-fits all approach, but rather the benefits and costs of risk management are dependent on factors such as organizational size, complexity, vertical industry, and location. Considering these factors when planning the scope of a cyber risk management implementation will increase the odds that its benefits will be more clearly understood and supported across the organization. Instead of relying on employees to implement cyber risk management in silo-based fashion using antiquated tools such as spreadsheets to document their findings, organizations should consider the use of an intelligence-driven and platform-based system. Pitfalls to look out for include making sure that the derived risk scores are based on a scientific approach that take a multitude of factors (i.e.., vulnerability risk rating, IP reputation, accessibility, and business criticality) into account rather than singling out for instance just the external risk exposure of an organization. In this context, it is essential to assure proper integrations with internal security intelligence data sources to secure investments into existing IT and security tools and to leverage the data to unify with external threat data and business criticality. Organizations that address the above-mentioned inhibitors to cyber risk management head-on, can significantly reduce the time it takes to identify their cyber risk exposure, quickly orchestrate remediation, and monitor the results. In case of the WannaCry outbreak, a properly implemented cyber risk management program would have identified the exposure and business criticality of the threat weeks prior to the attack, giving the organization plenty of time to patch systems in a controlled and orderly fashion.